Looking to Support the LeMarquands with a one-time gift? A view from the LeMarquand's Land Cruiser. In order to keep from finding themselves without a running vehicle, Bishop Grant and Dr. Wendy LeMarquand, have opened a car fund. As Grant says, “IF (and only IF) you are looking to give a one-time gift (maybe for Christmas! ), or if you know someone interested in our ministry who might be interested, here's a way. 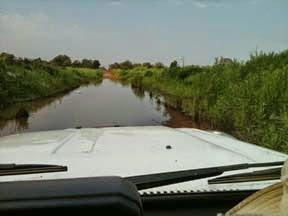 Currently they have a 13-year old Landcruiser that is still running, but this car fund will ensure that should they find themselves without a vehicle they will not be stuck. Learn more.